If you are looking for a new job, you might as well check this site out. 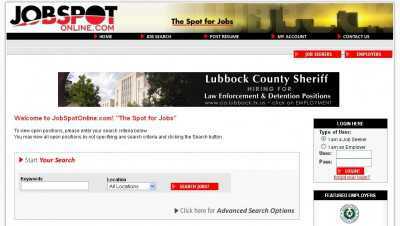 On LubbockJobSpot.com you can search for jobs in lots of different areas, and get timely results. Medical jobs, jobs for accountants, jobs for IT technicians… the site lets you find jobs in all these areas using a quick interface. By choosing your area of interest and specifying where you are located you’ll get to see all available job openings in that area. 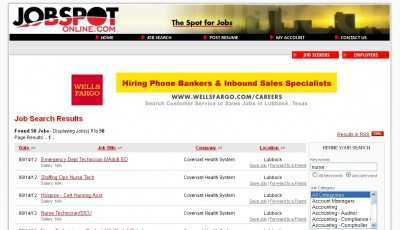 And LubbockJobspot.com also lets job seekers post their resumes online, and have matching jobs delivered to them straight to their email inboxes. In order to do so, one must become a registered user of the site first. That costs nothing, and an account can be created by submitting information like your name, your address, your phone number and your State/Province. And employers can also sign up here, and fill their open positions by posting as many listings as they want. This service is also provided at no cost, and listings can be updated an unlimited number of times once they have been published. So, it’s very easy to post a generic ad and change it as you go along.